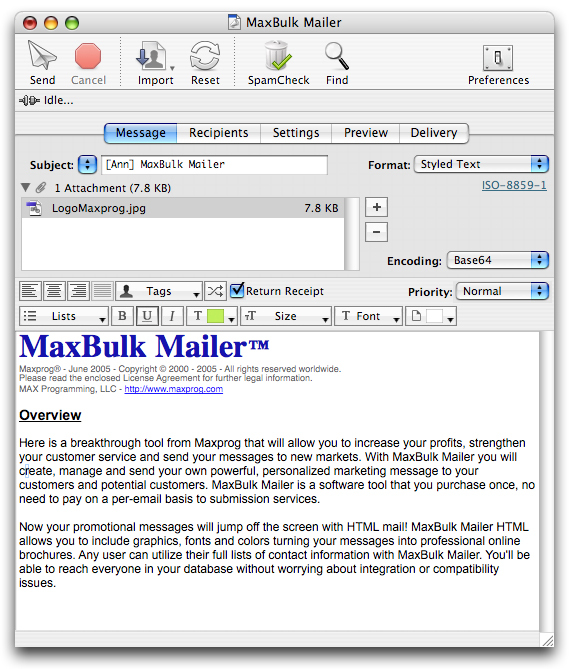 [prMac.com] Los Angeles, CA - Maxprog is proud to present a new release of MaxBulk Mailer, new version 6.0, available now on Maxprog website with several interesting new features and improvements. Version 6.0, available now in English, German, French, Japanese, Italian, Spanish, Dutch, Chinese, Russian and Portuguese. MAX Programming, LLC. also known as Maxprog(R) is a privately held company dedicated to Macintosh, Windows and Linux software development. MAX Programming mainly develops and markets Internet, communication and database tools. MAX Programming is unique in its approach to business, especially when it comes to customer care and satisfaction. In fact, our goal is to give each customer the utmost in personal attention and service. MAX Programming, LLC was founded in the early nineties by French-born programmer Stanley Roche Busk, after over 15 years of experience in the high-tech networking industry and computer software development, now Chief Executive Officer of the company. Since its creation, MAX Programming has built firm business relations with thousands of clients from over 136 countries with products localized in up to 10 different languages. Copyright (C) 2008 Max Programming, LLC - All rights reserved.